Belarc Advisor is a free personal PC Audit software that builds a detailed profile of your installed software and hardware. What this tool also does is identifing licenced software and unlicenced ones. Stupid enough, it makes a list of those licences, and for some reason, different websites publish this hidden somewhere on their website. But as we all know, you can keep nothing secret from our good old friend Google. 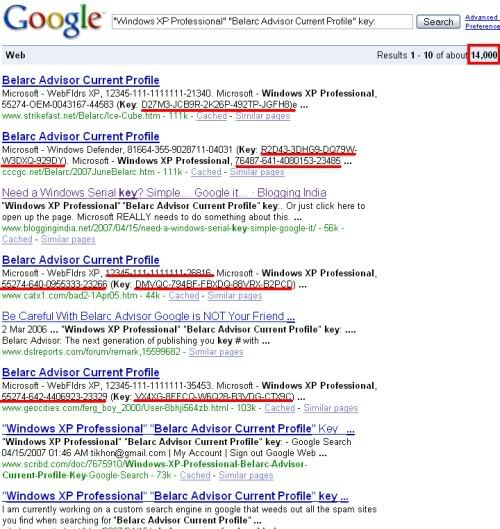 So...if you need a software licence, just google for "Belarc Advisor Current Profile" (quotes included) and see a computer report with everything that computer has installed and the serials for those softwares. If you want to be more specific, add the software name in the google search: "Windows XP Professional" "Belarc Advisor Current Profile"